Tulsa Pool Covers That Pass the "Bubbles the Elephant" Safety Test! 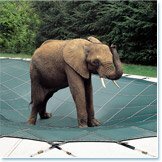 Most Tulsa pool covers won't need to be strong enough to support the weight of "Bubbles," the African elephant seen here, but imagine how safe you'll feel owning the only pool cover that's proven it can! LOOP-LOC safety swimming pool covers! Metro Pool Service has installed hundreds of these very popular Tulsa pool covers in the metro area. These Tulsa Pool Covers Are Built From The Highest Quality Materials! Built super-strong utilizing only the highest quality materials and workmanship, and securely anchored into the deck, a LOOP-LOC safety swimming pool cover puts a "lock" on your pool to protect your family. 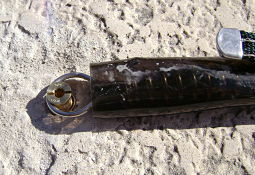 And LOOP-LOC's exclusive Computer Aided Design assures a perfect, custom fit for any shape or size pool. Your Tulsa pool cover will always stay tight, clean and beautiful on your pool. With the covers that let the rain water through, the leaves simply blow across the tight surface of the cover leaving no unsightly mess! It's the perfect choice for customers who want less light and debris in their pools, but still want the one of a kind protection of the only Tulsa pool cover proven safe and strong enough to support an elephant! Built super-strong and securely anchored into the deck, a LOOP-LOC swimming pool cover puts a safety barrier on your pool to protect your family. 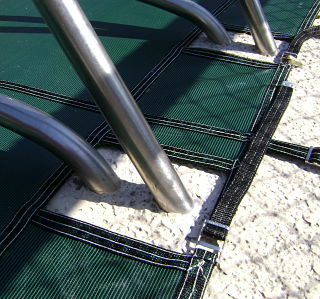 The Covers are Secured Using Deck Anchors and Springs. 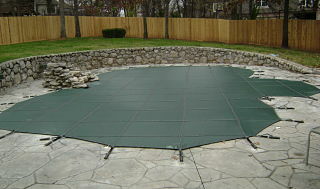 LOOP-LOC swimming pool covers made of Ultra-Loc with drain panels are solid except for the mesh drain panels located in the center of the cover. They don't require a cover pump because the water can enter the pool through the drain panels. This cover is in the middle of the 3 types when it comes to cover cost. LOOP-LOC covers made of Ultra-Loc with drain panels are solid except for the mesh drain panels located in the center of the cover. They don't require a cover pump because the water can enter the pool through the drain panels. This swimming pool cover is in the middle of the 3 types when it comes to cover cost. Whichever cover type you choose, Metro Pool Service will give you the kind of top quality installation you would expect from a company that has been proving itself in Tulsa Oklahoma and the surrounding areas since 1985. 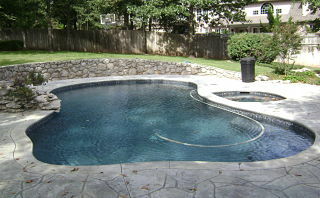 Call Metro Pool Service today to get a quote...........................918-622-4400.